An artist in Welcome gives her customers a way to keep the animals they love close to their hearts. Marie Evans sits in the sunny, second-floor studio of her historic home in Welcome, carefully clipping a pattern out of fabric. She’s working on one of her most common customer orders: a pet portrait. 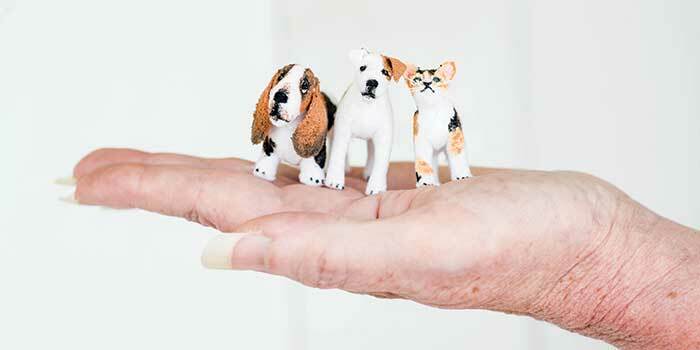 Better than a photograph or painting, Evans’s pet portraits are three-dimensional miniatures created in the exact likeness of a customer’s dog or cat, down to the smallest details. Evans, whose pocket-size creations have become a full-size career, developed her artistic eye studying painting at Virginia Commonwealth University before pursuing dance in New York City. She returned to North Carolina to perform in The Lost Colony on Roanoke Island, where she also served as an assistant choreographer. After 13 years with the outdoor drama, she briefly made stained-glass windows before realizing that what she really wanted to do was create miniatures. Since then, Evans says, she’s made between 750 and 800 pieces. Today, collectors find Evans at miniatures shows — where she sells mostly dolls and animals but occasionally receives a commission for a small-scale house — or order online from all over the world. Evans stitches together each pet portrait using a photograph of the animal as a guide. She sews the fabric inside out, then flips and stuffs it. After painting it, she adds fur if the animal is fluffy. Each one gets glass beads for eyes. These animals are small: They’re on a one-inch scale, where one inch equals one foot. But some of her creations are even smaller. When making dolls on a half-inch scale, Evans uses air-drying clay because they’re too tiny to sew. As she works at the table in the center of the room, Evans’s diverse creations surround her. “I make all kinds of characters,” Evans says. She creates what she calls “soft-sculpture” dolls from fabric with wire frames and painted faces. She dresses graceful fairies in silk flowers and clothes stately Victorian people in historically accurate costumes, including their petticoats and shoes. And, with the utmost care, she delicately paints a tiny face on each little person. The shelves of Evans’s workshop are also populated by her interpretations of specific characters, like Alice in Wonderland and Snow White. And towering over all these people and animals are her miniature houses, where one could easily imagine the dolls eating, sleeping, and playing. The same attention to detail that makes Evans’s dolls remarkable is clearly visible in her houses. She takes into consideration everything from the number of panes in each window to the number of rafters in the roof. With the smallest houses, which are on a quarter-inch scale, she has to use tweezers to place decorations. Evans enjoys the challenges that each new project brings. Though her influence spans the globe, Evans remains deeply rooted at home. She lives next door to her parents’ farmhouse outside Lexington, and it’s easy to see their creative influence on her. Evans’s mother crafts ornaments from the okra in her garden, and her dad’s handiness is evident in the furniture and other wooden pieces he makes in his shop out back. Evans uses her father’s workshop to cut the fiberboard for her houses and helps her mother by painting on the faces for her decorative okra people. It’s clear that she was born with talent, but Evans says her art is all about observation. Bigger is better, some people say. But the charming details of Marie Evans’s miniatures might make you believe otherwise. You’ll see it, if you pay attention. To see more of Marie Evans’s miniatures and to purchase your own, visit etsy.com/shop/mariewevans. Caroline Leland was an intern at Our State during spring 2013. Her most recent story for the magazine was “Peach Student” (August 2013).